Microgaming’s Thunderstruck 2 comes with four free spin rounds, random bonus features, and wild multipliers, helping players win a huge pile of coins. 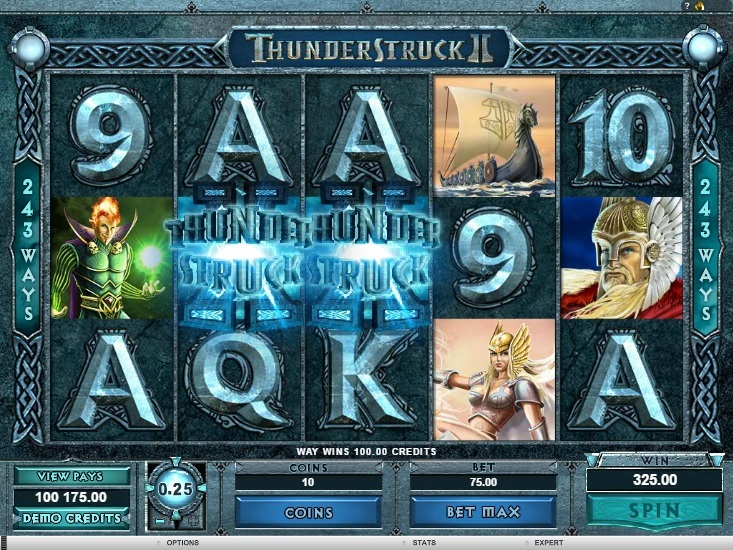 To play Thunderstruck 2, players only have to place a bet and hit the Spin button. They will get rewarded if a winning combination of icons gets displayed on the screen. Thunderstruck 2 is the sequel to Thunderstruck, which was released in 2003. Based on the theme of Norse mythology, it is similar to Thunderstruck, but much better in terms of graphics, sound effects, bonus features, and game play. The reels feature icons of Norse gods and their weapons. The Thunderstruck II symbol serves not only as the wild, but also as the multiplier. If players spin a combination of five Thunderstruck II symbols along an active payline, they will win the top fixed jackpot of 1,000 coins. The Thunderstruck II symbol will not substitute for the Hammer symbol to help players unlock the bonus feature. The Hammer symbol pays even if it appears scattered all over the reels. If players land two, three, four, or five Hammer symbols anywhere on the reels, they will win scatter payouts of x1, x2, x20, or x200 their bet amounts. If players land at least three Hammer symbols anywhere on the reels, the Great Hall of Spins Bonus gets activated. This bonus feature includes four different types of free spins bonus rounds. The Valkyrie Free Spins Bonus Round, which is always unlocked, includes 10 free spins with a multiplier value of x5. In the Loki Free Spins Bonus Round, players will get 15 free spins along with an extra wild icon. If players land a Wild Magic symbol on the third reel, up to 14 regular symbols can get transformed into Wild Magic symbols that can substitute for other symbols. The Odin Free Spin Bonus Round includes 23 free spins, and whenever players spin a winning combination, the Wild Raven Bonus Feature gets activated. When this happens, two ravens will fly across the reels, touching random symbols and transforming them into multiplier symbols, which can substitute for the other icons on the reels and help players spin winning combinations, the payouts of which are multiplied by values of x2 or x3. The Thor Free Spins Bonus Round includes 25 free spins. If players spin a winning combination during this round, the Rolling Reels Bonus Feature gets activated. When this happens, the symbols in the winning combination explode and vanish. Symbols from above will then fall into the spaces created, leading to more winning combinations, more explosions, and more wins. The game also comes with a randomly activated Wild Storm Bonus Feature, which can convert up to five reels into wilds. Thunderstruck II is available at all Microgaming online casinos.